Because of the number of grocery shoppers practicing couponing nowadays and the flood of coupons being presented at grocery stores, it is important to at least be acquainted with the coupon policies of local grocery stores. For New York shoppers, here are a few of those coupon policies. King Kullen (Syosset, New York) – King Kullen doubles all manufacturing coupons only up to $0.99. For each customer, the first five-$1 coupons can be doubled while all the rest of the dollar coupons will be accepted as it is. The store does not allow substitutions and coupons presented should not be more than the amount of the item. As for coupons taken from the Internet, King Kullen accepts those kinds of coupons, however not including those “for free” product coupons. The store also does not accept competitor coupons. Shop Rite (Plainview, New York) – Shop Rite doubles manufacturer coupons only up to $0.99. The store also accepts Internet coupons. Shoppers might want to register for the store’s Price Plus Card in order to receive product discounts that are exclusive for members only. Whole Foods (Jericho, New York) – Whole Foods accepts both Internet and manufacturer’s coupons. 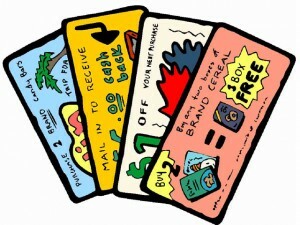 To collect coupons for the store’s private label brands, visit its website and click on the “coupon” tab. Waldbaums ( Jericho, New York) – Waldbaums accepts coupons taken from the Internet. However, the store does not allow doubling of coupons. Target (Hicksville, New York) – Target accepts manufacturer coupons, as well as those issued by the store. A manufacturer coupon and a Target coupon can both be used for the same item. Coupons presented should not be more than the price of the item. Target stores do not allow the use of competitor coupons in its stores.